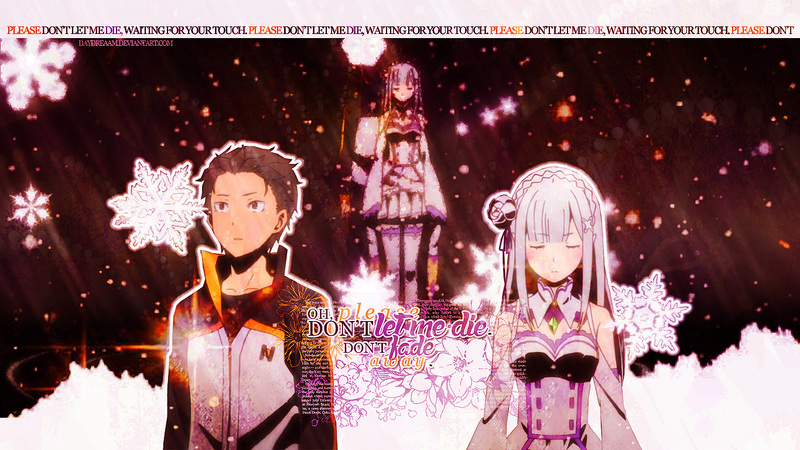 Re:Zero Wallpaper: Please Don't Let Me Die. Minitokyo »	Re:Zero Wallpapers » Re:Zero Wallpaper: Please Don't Let Me Die. Oh, please don't let me die, waiting for your touch. No, don't give up on life, this endless dead end. ~ MYTH & ROID. Credits: http://crazykira-resources.deviantart.com/, http://obsidian_gaze.livejournal.com/, http://unbreakable-fusion.webs.com/, http://Evey-V.deviantart.com/, http://carllton.deviantart.com/, and http://www.dafont.com/. That screencap resolution.... could have been better if you searched for high quality images, or even started from scratch by yourself (vectors or digital painting), but for now I see all those pixels flying all over your piece really distracting. Quote by wafflefoxThat screencap resolution.... could have been better if you searched for high quality images, or even started from scratch by yourself (vectors or digital painting), but for now I see all those pixels flying all over your piece really distracting. Ahahah, yeaah, I admit it's probably not the best quality ever; I just used the screencaps I took from the second episode that I saved way back when to make it, and I'm not really well-versed in either of the methods you suggested. xD Although, I think it's more the textures I used to MAKE it look messy that you're referring to as the "distracting flying pixels..."